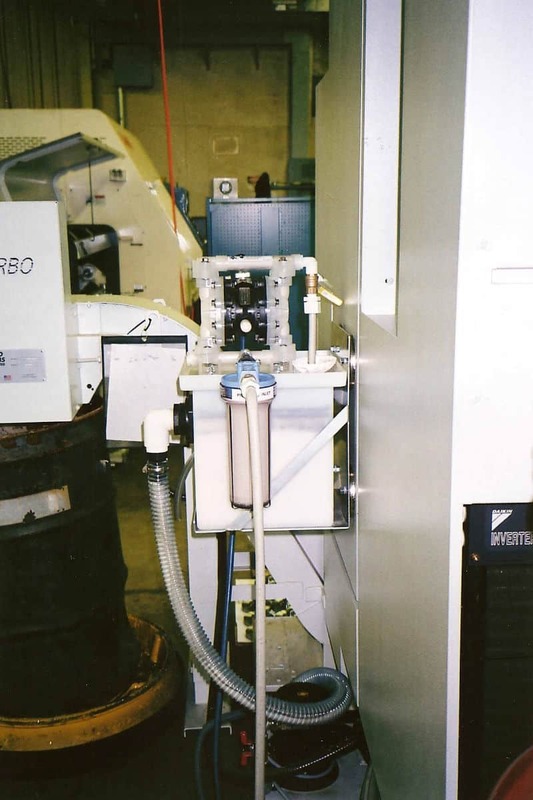 Until a few years ago, interest in maintaining the cleanliness of coolant in machine tool sumps arose chiefly from in-shop environmental concerns: odor was a problem, there was smoke in the air, or operators were suffering from contact dermatitis–all problems attributable to tramp oil in the coolant. However, while the environmental issues continue to be important, in the current difficult economy most shop managers recognize intuitively that maintaining clean coolant in the machines is essential for running an efficient and profitable shop. After all, if machine tools ran just as well with dirty coolant as with clean coolant no one would ever change coolant. However, despite the general agreement that clean coolant saves money, it is a rare shop manager who has actually calculated the cost savings resulting from maintaining clean coolant in the machines, and the savings are quite significant. A good coolant maintained regularly with an efficient pump/skimmer unit can run at least one year in the sump before it should be changed. With no skimmer or with an inefficient belt or disc skimmer, the coolant must be changed every two months, or six times per year. Therefore, with efficient coolant maintenance, annual coolant purchase and disposal costs are reduced by five changeouts per year, or 83%. In addition, reducing coolant changeouts from six per year to one per year will similarly reduce by 83% the labor required for changing the coolant and the machine downtime during coolant changeouts. Running with clean coolant significantly reduces tool wear compared with running with dirty coolant. Based on feedback from hundreds of shops, a conservative estimate for the benefit of clean coolant is a 10% saving in tooling cost. The following cost savings are calculated for one machine with an 80 gallon sump. The reduction in coolant changeouts will save five changeouts per year, or 400 gallons of coolant in the sump per year. The concentration of coolant makeup is assumed to be 5%. We can cite the example of PV Engineering (Salisbury MA) to illustrate the fact that cost savings and improved shop efficiency are now the driving forces in the decisions by shops to install efficient cooling cleaning equipment. PV Engineering, founded in 1988, is a family-owned shop serving the defense, power generation, and medical markets. They employ 21 CNC machines, primarily machining stainless steel. After analyzing his shop’s operation, Peter Vlismas, vice president of PV, concluded that ineffective coolant maintenance was having a detrimental effect on the performance of his shop. 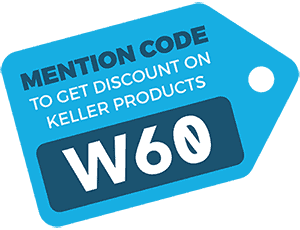 He contacted Keller Products, Inc., a leading supplier of coolant cleaning equipment, and cited the following specific objectives: “Minimize waste, run cleaner, and improve profits.” Since Keller has more than 5000 coolant cleaning units operating successfully in shops and the cost estimates suggest a potential saving by PV of more than $80,000 per year, the Keller salesman quickly reached an agreement with Peter Vlismas to initiate a test program. PV installed a TKO-14 pump/skimmer unit at the sump of one machine. 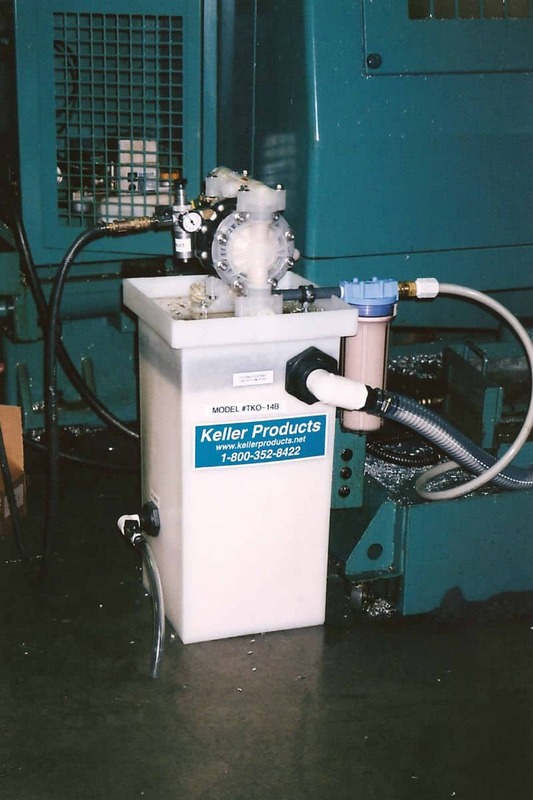 In common with all Keller pump/skimmer units, the TKO-14 pulls oily coolant from the surface of the sump, filters to remove suspended solids, separates the tramp oil from the coolant with the patented Keller maintenance-free separator elements, and returns the cleaned coolant continuously to the sump at high flow rate. 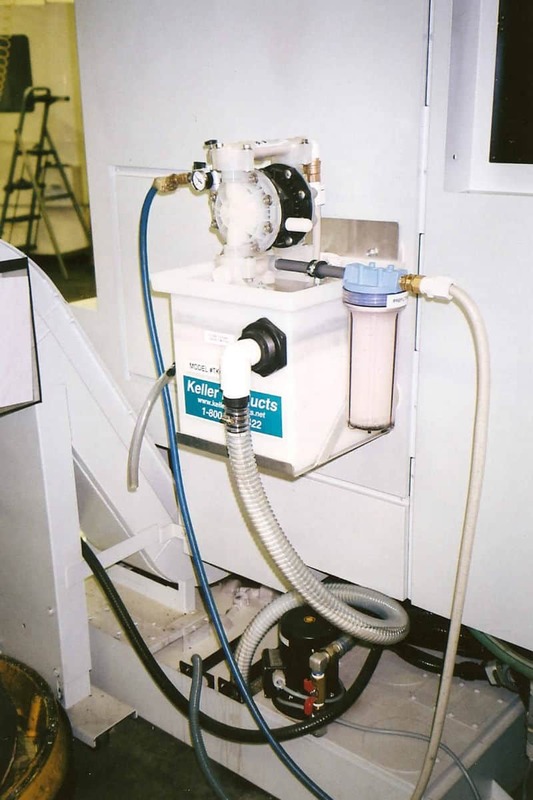 In contrast to the belt skimmers that PV had previously tried, a Keller pump/skimmer with a 1/2″ air-operated diaphragm pump turns over a sump rapidly-for example, a 90 gallon sump will be turned over twice per hour-aerating the coolant and ensuring that there are no stagnant areas of the sump in which oil and solids can accumulate. The separator may be run when the machine tool is operating or is idle. Conclusion: Maintaining clean coolant is an important Lean Manufacturing initiative.